Calcium Rich Breakfast Recipes, Calcium Rich Indian Breakfast recipes. Breakfast is the most important meal of the day. Never ever skip it. 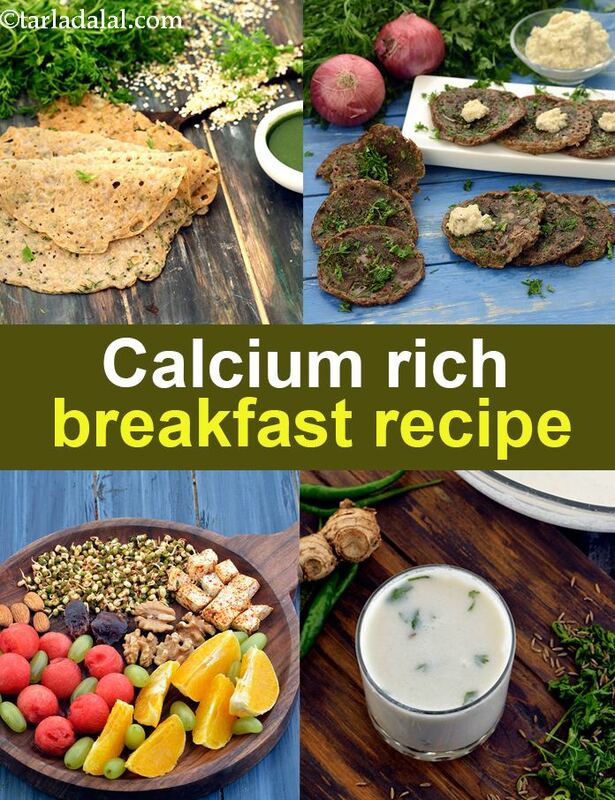 We present to you healthy Calcium Rich Breakfast recipes using Calcium Rich Foods. It’s all healthy. We have skipped the use of unhealthy ingredients like Sugar, Cornflour, Maida, Corn, Potatoes in the effort to give you healthy Indian Calcium recipes. Calcium will make your bones strong and its a mineral that needs to be topped up daily as the body does not store it. So lets find some exciting recipes for you. We have given you a super healthy Ragi Roti stuffed with Paneer for breakfast instead of choosing Aloo Paratha. Another good option is Nachni Paneer Pancake. We all love our curds. Every household in India makes their curds at home. Little do they know its a treasure trove of Calcium. You could make Low Fat Curds or Full Fat Curds for breakfast. Want to loose weight then low fat curds and if you are lean and fit, then please use full fat curds. It contains good fat and keeps you fuller longer. You could make a raita like Onion Raita or Palak Raita to go with Ragi rotis for breakfast. Buckwheat is a super food for Vegetarians and the base for a healthy breakfast. It’s protein rich and contains all 8 Amino Acids plus rich in Calcium. Try our Buckwheat Dhokla or Buckwheat Groats Apple Porridge which is a meal by itself. Last but not least, we love this Dosa made with Buckwheat caleed Buckwheat Dosa. It’s given as a snack in Tarla Dalal’s office. It’s that good. You can get more Calcium Rich Recipes here and the list of 44 Calcium Rich Foods which will help you meet you daily Calcium target of 1,000 mg. We hope you enjoy our collection of Breakfast recipes from from healthy porridges and pancakes to oats and dhoklas. Enjoy our collection of Calcium Rich Indian Recipes given below from Calcium Rich Breakfast to Calcium Rich Desserts. Tarla Dalal Thanks a lot for the word of appreciation. The nutrition values are calculated from Nutrition Value of Indian Foods and Indian Food Composition Tables. Do keep trying our recipes and share your valuable feedback. We look forward to them.